At AB&C Arco bed and camping in Arco (Trentino) camping costs as little as €20,- per night during low season with CampingCard ACSI. At one of the 19 touring pitches you will get a discounted rate during the period 22-03-2019 - 14-04-2019, 06-05-2019 - 25-05-2019, 03-06-2019 - 08-06-2019, 23-06-2019 - 01-07-2019, 02-09-2019 - 02-10-2019 and 14-10-2019 - 25-10-2019. At this campsite you can not only use your CampingCard ACSI for inexpensive camping, you can also use your ACSI Club ID (as an alternative ID). 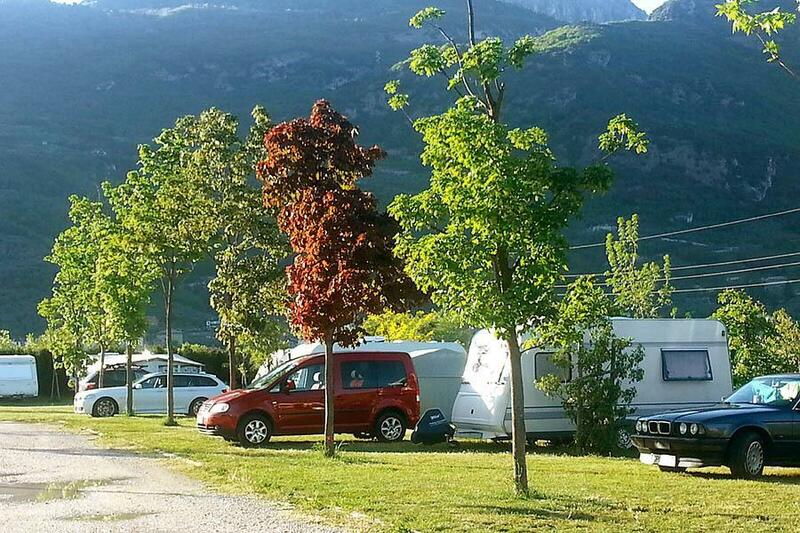 A small, quiet campsite with clean toilet facilities and a small swimming pool in the town of Arco. What a peach of a site, a family run concern providing level grass pitches with nearby electric and water available close to each pitch. The toilet and other facilities are centrally located and spotlessly clean. The site has a small, but again beautifully maintained pool, with smart sun beds and parasols in abundance. The facilities extend to cycle hire, free to guests, with an underground secure garage to store your own bikes and motor cycles etc. Nearby there are well marked out cycleways leading along the valley towards Trente and in the other direction leading to various of the small towns on the north end of Lake Garda. 2 large supermarkets within a short walk, lots to see and do in the area, catering for all. We came as an overnight stop, 4 days later we’re still finding things to do nearby. 8.3 does not do it justice. And did I mention the family running the site? They care so much for the success of their site, and it shows. Would you like to book AB&C Arco bed and camping or request more information? You can do both using the information below. A22 Brenner-Modena. Exit Rovereto Sud/Lago di Garda Nord. Follow Lago di Gardo to Arco via SS240 and SS240 dir. At roundabout 3rd exit SP118. Then SS45 bis to Via della Croseta. CampingCard ACSI will send your information request to "AB&C Arco bed and camping".